Washington, DC – September 9, 2015 – HIDE/ScorpioMoon Productions, in partnership with the Atlas Performing Arts Center, has announced an exciting concert experience on September 24-26, 2015 at 8:00 PM as part of the Jazz at the Atlas Series. 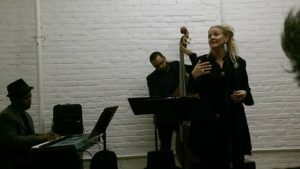 Three riveting evenings of performance highlight vocalist Heidi Martin as a conjurer of the vocal and dramatic majesty of jazz legend Abbey Lincoln’s indomitable life force. Lincoln, heralded for her pioneering music, acting and civil rights activism, comes to life while Martin takes listeners through a series of affirming events and revelations, enveloped in gorgeous music and poignant history. Martin will be joined by several highly acclaimed bandmates also known for their time with Abbey Lincoln, including pianist, Colin Chambers; bassist, Michael Bowie; drummer, Steve Williams; and trumpet player, DonVonte McCoy. Tickets are $25.00 in advance and $30.00 at the door. “Documenting in text, music, staging, and sound quality the social genius of an artist once branded ‘misguided and naïve’ by jazz critics, ABBEY! is the product of considerable scholarship and deliberative editing on Martin’s part. Her performance also documents a personal relationship across race and generation between two women who met briefly in DC and NY and shared one three-hour phone call in the middle of the night. Clearly from the way Lincoln’s words have haunted Martin’s body…listeners will enjoy the paradoxical experience of hearing an unapologetic white artist respectfully channel the strength and beauty of jazz music’s first black power diva.” — Dr. Thomas Stanley, artist, author, and ethnomusicologist.